Even though we at Percy Tours are not the greatest of club football fans, we sure do enjoy our 4 yearly indulgence of World Cup football soccer action, supporting the under-dogs to overthrow bigger footballing nations. Being in Africa, we cheered on the African teams in Germany in 2006 and much praise must go out to our 4 teams, who put some serious scares into the more established teams. So a big cheer goes out to Ivory Coast, Ghana, Angola and Togo. With Germany hosting their perfectly organised games, many here in South Africa suddenly thought we had better get our skates on if we are to be ready to host our own World Cup in 2010. The South African press has (sadly) been slating its own country, by scare mongering, saying that we won’t be ready, but this Ladies and Gents is just sensationalised media propaganda aimed at doom and selling newspapers; when infact South Africa is already doing a mighty fine job at delivering infrastructural facilities – now!! For example – South Africa already has its own World Cup logo designed and using it to full effect worldwide – when Germany only had its logo design ready 2 years before their games. South Africa 2010 merchandising is already on sale in many of the stores here too. In Jo’burg, the Finals stadium is already very close to being finished, with official announcements stating that the doors will be to open for action as early as the end of 2006. It’s a marvellous state-of-the-art complex, with the facilities being extremely ultra-modern and high-tech. The new Gauteng railway is already under construction, (a full year ahead of schedule) – this is the high-tech railway between Jo’burg and Pretoria to assist the transfer of football fans between games. ALL the major airports are in full construction of new terminals and facilities – with Cape Town airports big new multi-story car park just being opened afew months ago. 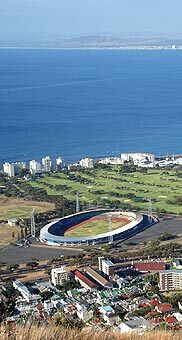 Cape Town has decided to build its brand new 68,000 seater stadium close to the site of the current Green Point stadium, which will host many games, including one of the semi-final games. Located within a short (and safe) 10 minute walk of the magnificent V&A Waterfront complex – with its multitude of top-class hotels, (like the award winning 5 star - Cape Grace, Table Bay, One and Only and Arabella Sheraton), 100’s of shops, restaurants, bars, a large craft market, cinemas, open air amphitheatre, access to Robben Island and many other tourist attractions. However South Africa’s national side (called Bafana Bafana) is another story altogether and are currently a miserable shower, in comparison to other mightier African footballing nations, but we have a plan – South Africa has just employed the fine services of ex-Brazilian coach Carlos Alberto Parreira (4 times manager of a World Cup team, including Brazil who won under his managership). He will certainly have his work cut out, but we are all urging him on to do a stunning job at turning around South Africa’s team. As a matter of fact there are many South African team members playing in major European clubs and this can only be extremely good for the sides training, skills, experiences and enthusiasm to be able to develop the national sides competitive edge fast. See you here for some excellent footballing and partying in 2010.